I have been lusting over these items for a while now, & my plan of saving will take a hit if I indulge. I haven't worn eyeshadow in a loooong time! Not since I did make up artistry. My go to make up is foundation, eyebrow filling, mascara, blush! But these past few days I have added brown eyeliner to my regime. I find brown is a bit more gentle on my eyes as black is just too harsh on my face (something I wish I would have realised back in high school where a smokey eye was my go to. Uh oh). I also find that the brown actually makes my eyes really pop, I find when I apply it my eyes look much bluer. So I thought it would be about time I tried out some powders to compliment the liner. I have heard rave reviews around the naked palettes & after doing some research I really like the colours in the Naked 2 palette as I found there is more range than the 1st & the 3rd palette is more dusky pink tones which don't suit me. How amazing is this product!? I need to get my hands on this asap! I have been using a Bourjouis liquid bronzer applied with a concealer brush for contouring but as its a long process I only use it for nights out. This contour stick seems so easy & quick to use! Just draw on & blend! Along with the contour stick, I need this too (oh when did I get so materialistic?). But seriously I love the idea of these sticks. I am currently using a Bodyshop Illuminator in a tube, but a stick seems like less wastage to me! I feel like I'm following the crowd here as I have heard a lot of hype around this! But I really love the sound of it. Exfoliating and oxygenating toner. Sounds great. It might also help me to get toning in my routine permanently as it's the one thing I always forget! I am a huge fan of Aesop & I love this hand balm. Because of the price tag I usually find myself using it so I don't waste it! Plus my hands are grateful & feather soft after every use. I adore this product! I am coming to the last of mine. I brush this all over my face once I applied my foundation & it gives a lovely light look without being too pigment heavy & giving your face a "Twilight" look. Oh man. This is by far the most beautiful perfume I have ever smelt. I was recently given samples of Tom Fords Velvet Orchid, Black Orchid, & White Patchouli, & Black orchid blew my mind. I have worn it non stop & need to invest in a bottle. What's everyone else lusting after? I grabbed a few bits from the Bodyshop the other day. 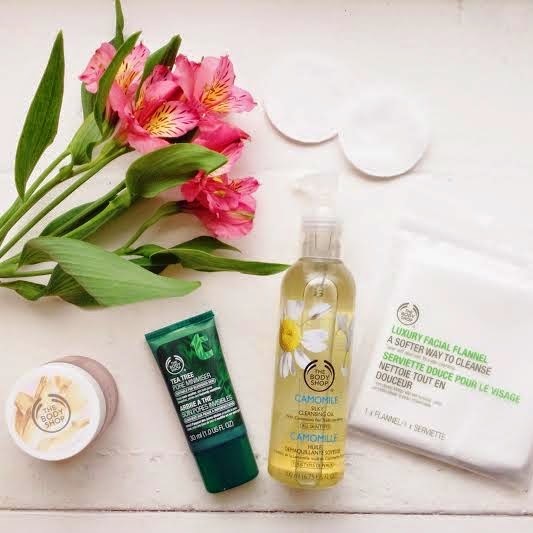 I have been after some skincare products to add to my routine. I bought this moisturiser purely because I loved the texture as soon as I saw it. I love it. After the first use I was hooked. This product is great on my skin which is normal/sensitive, I love that it leaves a cooling/tingling effect that leaves my face fresh and tingling after use. I have a Bodyshop Face brush which I use in the shower and then apply this moisturiser afterwards & it feels amazing. Like a little facial. I noticed lately that my pores are huge. I can't say that without thinking of Mean Girls haha. But yes as unflattering as it is I prefer a smooth base applying my foundation. So I wanted to check out this product. I love the smell of tea tree & love that it feels extra soothing on my face. I adore this cleanser. Before I go to bed I use a Micellar water to remove my make up, then with a pump of this oil I smother my face & get to work with a cotton pad. I feel that I am very thorough with the micellar water (I use until my cotton pad is clean) but I find that this oil goes deep & I love the silky feel finish. I really don't like flannels. I haven't used them in years actually but I thought I would give it all a go again. I liked the sound of this cloth & I love how it leaves my skin feeling exfoliated & buffed after removing cleanser. I have a new found love for Spring! I don't know if I have ever felt this grateful for the rays of sunshine Chester has been blessed with this week! Aside from British weather being British weather, (where it started to snow Tuesday morning then by 12 I was outside in the sun with my coat off for the first time in probably 6 months) this week has been a lovely one. I have even needed to purchase some new sunglasses as it has been so sunny I nearly walked into a lampost the other day (doh). Oh & these lighter days. I love waking up to sunshine & actually being able to see where I'm going (going to & finishing work in the dark is never fun). In light of this beautiful weather Spring has sprung, I have delved into my wardrobe to find some suitable clothes (seeing as I am getting too hot in my scarf & coat right now!). I thought I would put together some outfits I have been wearing these past few days via Polyvore. I cannot wait to permanently be in blazers & trenches again & actually be warm! Apparently next week it's going to be 16 Degrees over here! Can you tell I'm excited!? Anyone else feelin' the warmer weather?